Recently there has been a lot of debate about the safety of tanning beds and indoor tanning. While dermatologists are saying that tanning beds are just as bad as sun exposure, tanning salons are saying that tanning beds are a safe way to maintain your summer glow without the dangerous effects of the sun. Who is right? Is getting a little bit of extra color really worth all the risks? Read on to learn why people use tanning beds and the life-threatening risks associated with them. There is no safe alternative to sun exposure. Tanning beds and sun lamps emit the same ultraviolent (UV) light linked to skin damage that radiates from natural sunlight. This makes tanning beds and sunbathing equally dangerous methods of tanning. Despite the claim made by tanning salons that monitoring the use of UV light in tanning beds will help avoid sunburns and severe skin damage, the truth is any source of UV radiation is considered unsafe and a cancerous substance. Many people feel that they need to be tan to be considered attractive. In fact, numerous studies show that people with tanner skin are considered more attractive and healthier than people with pale skin. Tanning bed users see indoor tanning as a way to get a summer glow year-round by maintaining their color during the cold winter months. People also use tanning beds as a way to hide blemishes and discoloration by darkening the skin, which can adversely worsen certain skin conditions, such as acne, overtime. Regular sun exposure can help the body absorb vitamin D. However, some people do not get enough sun exposure, so they turn to tanning beds to make up for their vitamin D deficiency. Vitamin D deficiency can cause numerous health problems including autoimmune diseases, infections, and cognitive disorders. With so many risks associated with this particular deficiency, it is understandable why people may feel the need to tan excessively in an effort to keep their vitamin D levels up. However, the benefit of using a tanning bed to increase vitamin D levels can also be accomplished by taking a vitamin D supplement. But we’ll have more on this a little later. Some tanning salons say that tanning beds are safer than sun exposure. However, people can still get a sunburn from a tanning bed, which makes the risk of getting skin cancer just as high as regular sun exposure. A tan is your body’s reaction to UV radiation—your skin is trying to protect itself from future UV damage. Numerous studies have shown that the UV radiation you subject yourself to when you tan—both in a tanning bed and in the sun—can cause skin cancer. According to the International Agency for Research on Skin Cancer, people who use tanning beds before the age of 30 increase their risk of , the most deadly type of skin cancer, by 75 percent. If you have a family history of any type of skin cancer, especially melanoma, you should avoid the use of tanning beds and sunlamps since you are more likely to get the disease based on your genetics. According to the Center for Disease Control and Prevention, 11 states, including California, Hawaii, and Texas, have banned the use of tanning beds for people younger than the age of 18 in an effort to stop the rampant increase in skin cancer cases amongst young people. 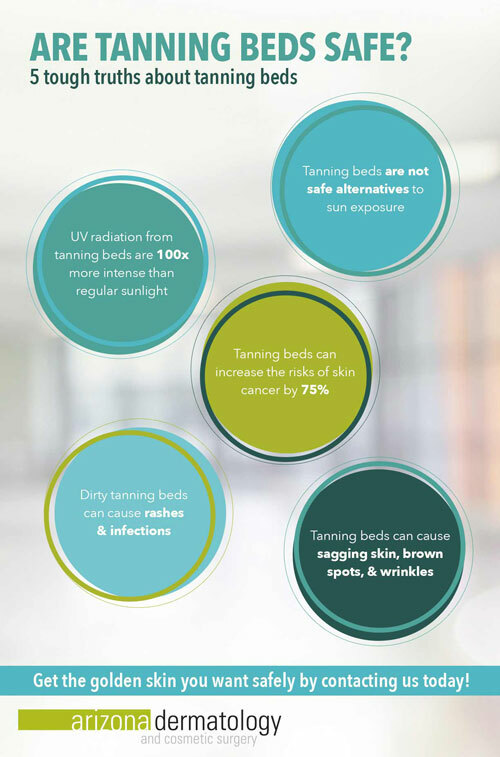 Tanning beds produce UV levels up to 100 times what you would get from the sun, so even a short session in a tanning bed can make you susceptible to any combination of the effects listed above. These effects show up overtime, so while you may think a few tanning sessions are OK because no negative effects are visible immediately afterward, you are really damaging skin deep underneath the surface that may take years to become noticeable. If you do not wear eye protection when using a tanning bed, you could be severely damaging your eyes. Sunburns on the cornea are common for tanning bed users. You can also develop cataracts and cancer in the connective tissue that surrounds your eye from excessive tanning, which can then spread to other parts of the body. You would wear sunglasses if you were out tanning at the beach all day, so make sure you are wearing the appropriate eyewear if you choose to tan indoors as well. Tanning in unsanitary tanning beds can cause you to get a lot more than skin cancer. You can pick up skin infections, rashes, and warts from a dirty tanning bed. The most common infection is called “tanning bed rash.” The intense UV ray exposure you receive from tanning beds dries out your skin, which can cause itching and redness. Although not as common, you can also receive tanning bed rash from laying in dried sweat from a previous user if the tanning bed was not cleaned properly beforehand. Many of these infections take a few days to show up on your skin, so you could have picked up more than just a little color from your quick trip to the tanning salon. What About Vitamin D Deficiency? Research has shown that natural, day-to-day sun exposure is adequate to keep your body’s vitamin D levels well balanced. However there’s no need to tan for hours, especially in a tanning bed. If you have a vitamin D deficiency, you can take a vitamin D supplement and eat yogurt or drink milk that has been enriched with vitamin D to help increase your levels without damaging your skin. By utilizing one of these tanning products, you can rest easy knowing that you are keeping your skin healthy while flaunting your new golden tan. Next time you are longing for a nice tan, think about the risks and the permanent damage you will cause to your skin by using a tanning bed. A sunburn may go away, but the long-term effects that a burn causes deep within your skin will not. While you may not see any negative results on your skin now, they may show up later in life. Whenever you are out in the sun, make sure to wear protective clothing and to always apply sunscreen. You’ve got your skin for life, and if you treat it well starting at a young age, you will look youthful and healthy for years to come.